To use Amazon’s Elastic Transcoder you simply upload the files you would like converted into an Amazon Simple Storage Service (S3) bucket (see How to use Amazon S3 with your Website). Doing this sometimes isn’t the most convenient thing to do if the files you want to convert are GBs in size, this is the only downside I see to using Elastic Transcoder. Once the files you want to convert are uploaded to a bucket on Amazon S3 go to your Amazon Web Services (AWS) Console and select Elastic Transcoder, below I’ll go into what you need to do to get up and running as well as go over some recommended settings. Click on Pipelines on the left-hand side and then click the Create New Pipeline button. Below I’ve shown an example, it doesn’t really matter what you name the pipeline as long as you can identify it. 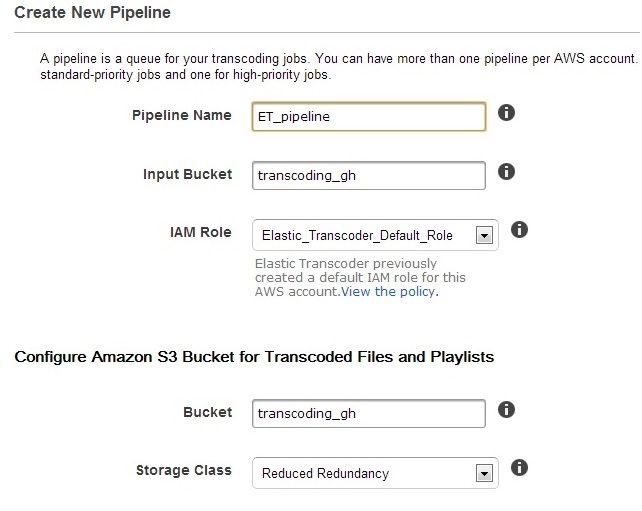 It Is probably a good idea to create a new bucket in Amazon S3 just for Elastic Transcoder. You can use the same bucket for the output too. If you aren’t going to be keeping your converted files on Amazon S3 for long, then it will more economical to make the storage class Reduced Redundancy. Do the same for the Thumbnails and add any notifications that you see fit, but be warned you may just want to be notified for error or warning events as the notifications can stack up quickly and be annoying. 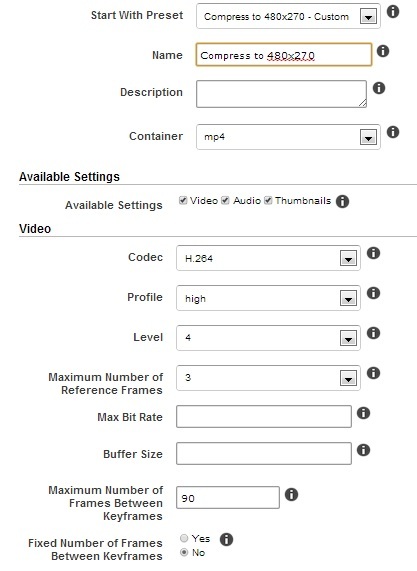 Amazon’s Elastic Transcoder comes with a number of useful presets that you can use to convert your video and audio files with. 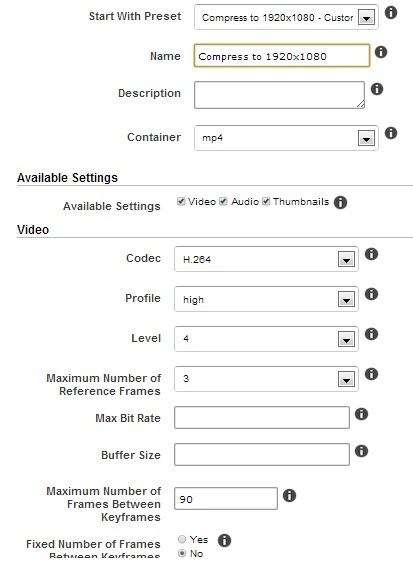 These presets dictate how your video or audio will be converted, for example, frame rates, compression, etc. I recommend some custom presets for specific reasons which I’ll detail below. 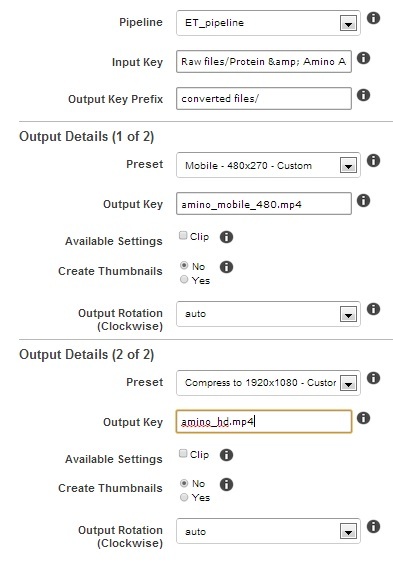 To create a custom preset, click on Presets one the left-hand side and then click the New Preset button. 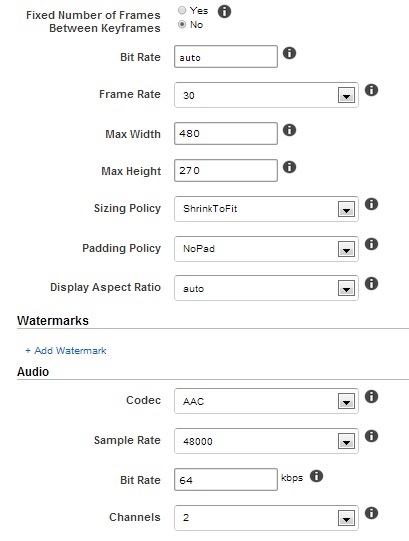 For videos that will be used with Mobile devices where the size of the file is very important, I recommend the following custom preset. With regards to the Thumbnails portion of the custom preset, I personally just leave the default settings. For videos that will be used with a website that will be viewed predominantly by Non-Mobile devices, I recommend the following custom preset. 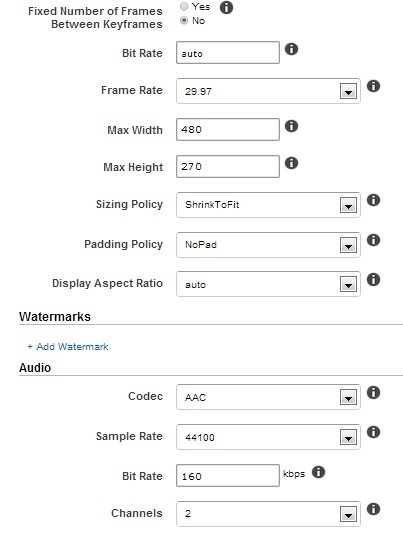 For videos that will be used to upload to Facebook, YouTube, etc that are not full 1920 x 1020, I recommend the following custom preset. 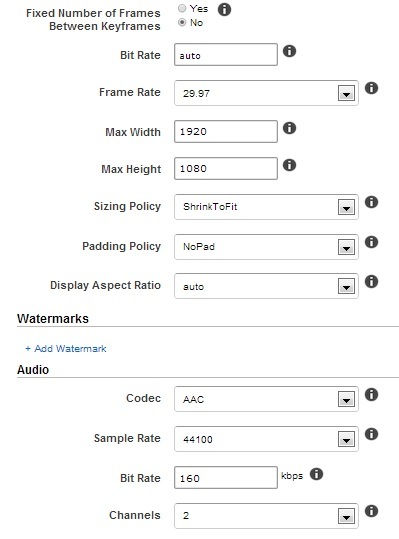 For videos that will be used to upload to Facebook, YouTube, etc that ARE full 1920 x 1020, I recommend the following custom preset. Before you create your first job you may want to add some directories to your bucket on Amazon S3 to make things easier, for example I created a directory for a) raw files, b) converted files, and c) thumbnails. Now that you have created your pipeline and any custom presets you’re now ready to create your first job. To do so, select Jobs from the left-hand side and click the Create New Job button. Select your Pipeline from the dropdown menu and click on the Input and Output keys to choose the directories and files you wish to use. Finally choose the Preset you wish to use (your custom presets will be at the bottom of the dropdown menu). 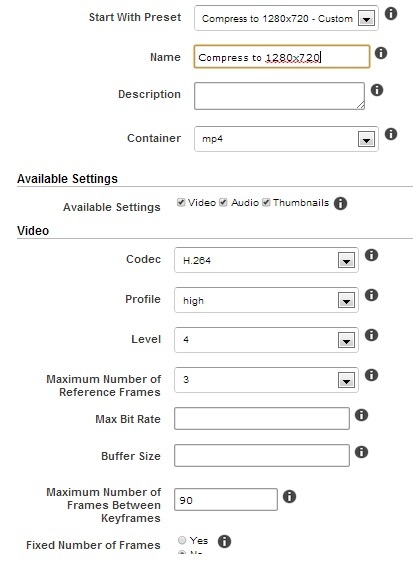 You can create multiple output in the same job to save time when converted the same video or audio file into multiple outputs. See below as an example. Finally click the Create New Job button in to the bottom-right of the page. You will then go to a page where you can create another job using the job you just created as a template. If you want to see the progress of your job select Jobs from the left-hand side, select your Pipeline from the dropdown menu, select Descending (to see the most recent job at the top of the list for convenience), followed by clicking the Search button. Once your job shows complete you will see the converted files in your Amazon S3 bucket (in the directories you specified). You can now download, make them public, etc. 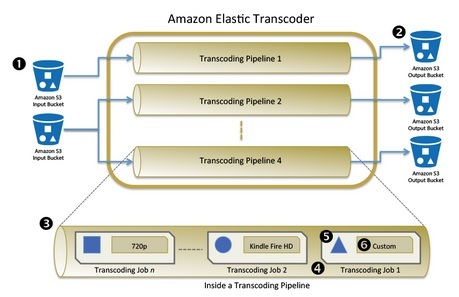 If you are using IE 10 or IE11, you may find this article of use (Creating a Job using Amazon’s Elastic Transcoder). How is Amazon’s Elastic Transcoder charged? 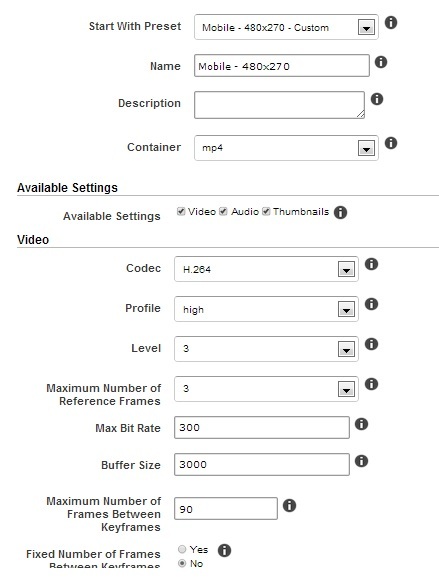 See the pricing for Elastic Transcoder here, but to give you a feel for how inexpensive it is, I probably converted 20+ 5 min videos during my research for this article and it cost $0.24!